Home » Anti-Aging » Potential Natural Treatments for Arthritis » Sesame Seed Trumps Tylenol for Knee Arthritis Relief? For many, it is a harsh winter once again, and it’s clear how Jack Frost is affecting your health. 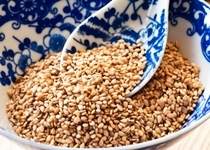 Pain and swelling in the knees after shoveling snow may be just the beginning for you, but luckily, one delicious seed could be the solution to your knee pain: sesame seeds. In fact, sesame seeds may be more effective than Tylenol. The knee is considered the most commonly affected area of osteoarthritis—a condition that is a concern for 80% of Americans over 50 years old. Over time, knee joint pain worsens with the cartilage continually wearing down, which produces aching bone spurs. Knee osteoarthritis, in particular, affects 12.1% of Americans 60 years old and over. Many people find relief from over-the-counter (OTC) non-steroidal anti-inflammatory drugs, such as “Advil” (ibuprofen), “Aleve” (Naprosyn), and “Tylenol” (acetaminophen). However, these are pain relief options I rarely consider. That’s because they may increase your cardiovascular risk and lead to adverse effects, such as internal bleeding, nervousness, weight gain, and digestive issues. So what would you think if I told you that eating a tiny seed could naturally complement your knee osteoarthritis treatment without any serious complications and at a reduced cost? A study I recently came across found that consuming 40 grams (approximately four tablespoons) of powdered sesame seeds for a two-month period reduced symptoms related to knee osteoarthritis better than two 500-milligram daily doses of Tylenol. Why do sesame seeds benefit those suffering from osteoarthritis? Sesame seeds contain good amounts of important nutrients helpful for bone and joint health, including copper, zinc, and vitamin B6 (pyridoxine). Simply put, sesame seeds help strengthen and improve your bone and joint health in your knees, while Tylenol simply treats the pain. When you grind sesame seeds, it can benefit digestion. I use a simple coffee grinder that you can usually find for around $10.00 at a department store. Many good sesame seed brands are found at your local health food store. They can also be found in the bulk section of most local grocery stores. Certified organic raw seeds are best to avoid gamma irradiation. I like to sprinkle black or white sesame seeds on salads and baked goods. I also enjoy making homemade tahini or hummus with organic hulled sesame seeds. It definitely makes a great snack when spread onto crackers, vegetables, or whole wheat breads. Tahini is also commonly used within Asian cuisine, such as stir-fries and sushi. What Other Foods Benefit Your Knees? What else can you eat to help protect your knees from osteoarthritis? I always consider foods that are high in zinc and vitamins A, C, and B6. Good choices include broccoli, summer squash, asparagus, and collard greens. You can also improve your osteoarthritis symptoms with herbs and spices, such as curcumin, ginger, boswellia, pine bark extract, grape seed extract, and Devil’s claw. Finally, vitamin D is important for bone and joint health. In the wintertime, most people lack the nutrient since it’s often obtained from the sun. There are some foods that contain vitamin D, such as organic eggs and some seafood (shrimp and sardines), but there aren’t many. Unless you get the right vitamin D supplementation, your osteoarthritis may flare up. It may be best to take a daily vitamin D supplement; talk to your doctor for more information and to see if supplementing is best for you. “Arthritis of the Knee,” OrthoInfo web site; http://orthoinfo.aaos.org/topic.cfm?topic=a00212, last accessed January 26, 2015. Eftekhar, S.B., et al., “Effects of sesame seed supplementation on clinical signs and symptoms in patients with knee osteoarthritis,” International Journal of the Rheumatic Diseases October 2013; 16(5): 578–82, doi: 10.1111/1756-185X.12133. Ji, S., “Eating Sesame Seeds Superior to Tylenol for Knee Arthrtis,” GreenMedInfo web site, November 10, 2013; http://www.greenmedinfo.com/blog/eating-sesame-seeds-superior-tylenol-knee-arthritis, last accessed January 26, 2015. Mateljan, G., The World’s Healthiest Foods: Essential Guide for the healthiest way of eating (Seattle: George Mateljan Foundation, 2007), 516–520. Murray, M., et al., The Encyclopedia of Natural Medicine (New York: Atria Paperback, 2012), 827–843. “Osteoarthritis,” Centers for Disease Control and Prevention web site; http://www.cdc.gov/arthritis/basics/osteoarthritis.htm, last accessed January 26, 2015. “Treatment Options for Osteoarthritis in the Knee,” Sutter Health Palo Alto Medical Foundation web site; http://www.pamf.org/sports/king/osteoarthritis.html, last accessed January 26, 2015.